That it was framed from a bard’s point of view. That it was sold as magical Memoirs of a Geisha meets The Name of the Wind. That the author was from the Philippines. That this was not the author’s debut novel. Anything about the author’s previous work. Some people claimed there was a cliffhanger, but I would argue it’s not a cliffhanger. Cliffhangers are literally named after the device used in old TV serials where the episode would end with the hero hanging off the edge of a cliff, and ‘tune in next week!’ slapped across it. It was designed to ‘force’/’emotionally blackmail’/ ‘fear of missing out’ people into watching the next episode. Lots of soap operas also use cliffhangers. I absolutely hate when first books in a series end on cliffhangers, or chop off the end of their resolution to stick it into the next book. I think it’s a horrible, cheap way to try to force the sale of the next book when the first story could have easily been wrapped up all on its own. Although this story was unfinished in the greater thread of the narrative, this book did not have a cliffhanger. It did not have an ‘edge of the seat what happens next’ dangling enticement tacked on to the end. 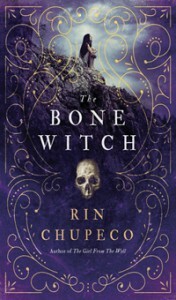 The Bone Witch was a complete story with all of its ends wrapped up, but with a promise and a threat that could be addressed in second novel. So I didn’t hate the ending, and it actually made me interested in reading the second book, rather than putting me off it. Memoirs of a Geisha is one of my favourite books and I was pleased to see the influence of geisha custom had on the story (I know MOAG is fiction, but it is still largely historically accurate in the portrayal of geisha custom). I’m still a little confused as to why these women warriors were trained in the fine arts to please men when the male warriors of the same skill, called Deathseekers, were not. I mean, historically geisha were first men, then a mix of men and women, and then only women. The asha and the Deathseekers were both skilled the same magically, and women asha were required to train in combat, but it seemed like they mostly hung around the Willows entertaining people while the men went off to battle. I understand that it’s really sexist but it just seems a lot to heap on asha: they must learn music and dance, singing, the art of politics, just like geisha, but they must also train as warriors (just in case, maybe?). I’m not saying this should have been more faithful to geisha culture, I’m just saying it wasn’t really addressed. If the women were required to stay in the Willows and entertain people and only occasionally some of them ventured forth to battle, why were they also required to train in combat? And if the Deathseekers were warriors, why couldn’t they also stay in the Willows and entertain people? I was also really confused about the concept of the heart’s glass. It just wasn’t very clear what it actually was: both an emotional mood stone and something precious you give to a romantic partner, and some of them can be remade and some of them can’t, and you need some kind of ceremony to receive one that everyone has to go through, and some people can make them and some people can’t. And does it sit on a chain around someone’s neck like a necklace? And how big is it? I was pretty confused. Nice concept, not very well executed. I did like however that there didn’t seem, to me, to be much infodumping. I think this is because Tea was ‘retelling’ her tale to someone who already knew a lot about what she was talking about, but not everything. I liked how in the asha culture, dressmakers and magical hairdressers were really important and I loved the descriptions of all of the clothing and jewels, and it was nice seeing that these things were important in this culture and not at all frivolous. It was also nice seeing a young boy destined to become a Deathseeker choose a different path: which ties back in to my criticism on the sexism between the asha and the Deathseekers. While I’m often reluctant to continue with book series, I’m actually enchanted enough by this world and characters that I’m happy to read book 2 and I can even imagine myself following this series long-term, which is rare for me.